Book Condition: Ships fast direct from Amazon! Comment: Ships fast direct from Amazon! Ships from and sold by VEENEESAA BOOKS. 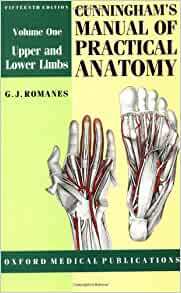 Completely redesigned in an attractive new format, this popular three-volume manual provides students and practitioners with a comprehensive guide to human anatomy and a dissection guide recognized throughout the world. For the new edition, the dissection guide has been separated from the text and remodeled to make it more distinctive and easier to read, and the text itself has been greatly expanded, with new sections on embryology, organogenesis, congenital malformations of clinical significance, and the new imaging and diagnostic techniques such as CT scanning. With an expanded general introduction and additional explanations throughout, the new edition will prove the best Manual ever, answering the needs of a wide array of students and courses. Ships from and sold by Lana shop ‘We deliver in 4 working days’. G.J. Romanes is at University of Edinburgh (Emeritus). 5.0 out of 5 starssaved me as a medical student!!! I have used all three volumes of this book as a medical student, pathologist, adjunct faculty member, and medical writer. It saved my bacon!!! As I'm visually oriented I found a way to also stand an anatomy atlas up while reading it --I'd recommend looking at several atlases and picking the one you like the best. In the 70's as a student, I used Grant's and Szentagothai. Today many of my students use Netter. I also recommend making simple sketches as one reads. As most students have time constraints, keep them as simple as possible; a couple of lines suffice. The simple sketches help in retaining a mental image of the structures. Using this approach, I consistently scored better than ninety per cent. 4.0 out of 5 starsExcellent Bedtime Reading! When I first got the dissector, I imagined it was going to be cumbersome and that I'd need to sit with a pencil and paper to diagram but instead Cunningham's text is a real pleasure to read. It's effortless to take in the details of dissection from the way it is simply and clearly presented in this text. I don't know what other dissectors are like but I suppose I would like a modern look to the diagrams, though this will do.